Amazon Web Services (AWS) has become a leader in cloud computing. One of its core components is S3, the object storage service offered by AWS. With its impressive availability and durability, it has become the standard way to store videos, images, and data. You can combine S3 with other services to build infinitely scalable applications. Boto3 is the name of the Python SDK for AWS. It allows you to directly create, update, and delete AWS resources from your Python scripts. If you’ve had some AWS exposure before, have your own AWS account, and want to take your skills to the next level by starting to use AWS services from within your Python code, then keep reading. Before exploring Boto3’s characteristics, you will first see how to configure the SDK on your machine. This step will set you up for the rest of the tutorial. You’ve got the SDK. But, you won’t be able to use it right now, because it doesn’t know which AWS account it should connect to. To make it run against your AWS account, you’ll need to provide some valid credentials. If you already have an IAM user that has full permissions to S3, you can use those user’s credentials (their access key and their secret access key) without needing to create a new user. Otherwise, the easiest way to do this is to create a new AWS user and then store the new credentials. 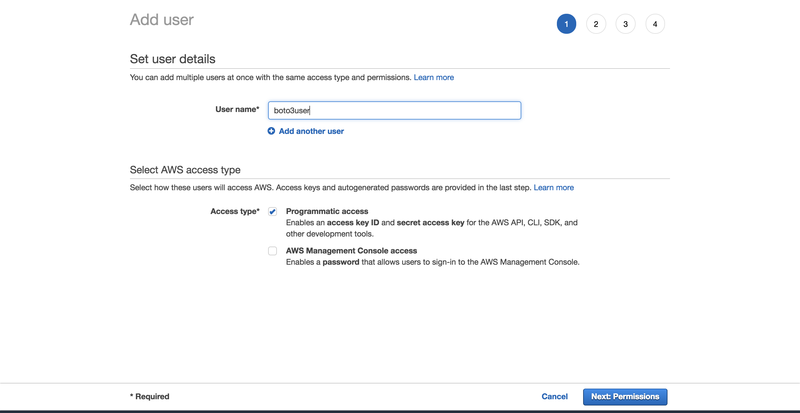 To create a new user, go to your AWS account, then go to Services and select IAM. Then choose Users and click on Add user. A new screen will show you the user’s generated credentials. Click on the Download .csv button to make a copy of the credentials. You will need them to complete your setup. Now that you have set up these credentials, you have a default profile, which will be used by Boto3 to interact with your AWS account. There is one more configuration to set up: the default region that Boto3 should interact with. You can check out the complete table of the supported AWS regions. Choose the region that is closest to you. Copy your preferred region from the Region column. In my case, I am using eu-west-1 (Ireland). You are now officially set up for the rest of the tutorial. Next, you will see the different options Boto3 gives you to connect to S3 and other AWS services. You can use either to interact with S3. With clients, there is more programmatic work to be done. The majority of the client operations give you a dictionary response. To get the exact information that you need, you’ll have to parse that dictionary yourself. With resource methods, the SDK does that work for you. With the client, you might see some slight performance improvements. The disadvantage is that your code becomes less readable than it would be if you were using the resource. Resources offer a better abstraction, and your code will be easier to comprehend. Boto3 generates the client from a JSON service definition file. The client’s methods support every single type of interaction with the target AWS service. Resources, on the other hand, are generated from JSON resource definition files. Boto3 generates the client and the resource from different definitions. As a result, you may find cases in which an operation supported by the client isn’t offered by the resource. Here’s the interesting part: you don’t need to change your code to use the client everywhere. For that operation, you can access the client directly via the resource like so: s3_resource.meta.client. 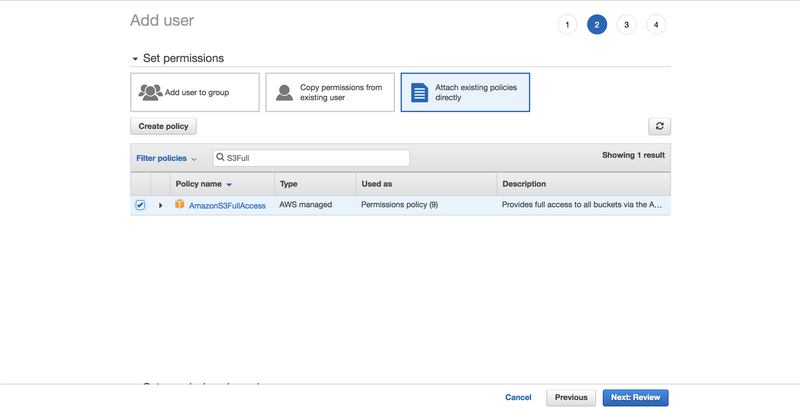 One such client operation is .generate_presigned_url(), which enables you to give your users access to an object within your bucket for a set period of time, without requiring them to have AWS credentials. Now that you know about the differences between clients and resources, let’s start using them to build some new S3 components. To start off, you need an S3 bucket. To create one programmatically, you must first choose a name for your bucket. Remember that this name must be unique throughout the whole AWS platform, as bucket names are DNS compliant. If you try to create a bucket, but another user has already claimed your desired bucket name, your code will fail. Instead of success, you will see the following error: botocore.errorfactory.BucketAlreadyExists. You can increase your chance of success when creating your bucket by picking a random name. You can generate your own function that does that for you. In this implementation, you’ll see how using the uuid module will help you achieve that. A UUID4’s string representation is 36 characters long (including hyphens), and you can add a prefix to specify what each bucket is for. You’ve got your bucket name, but now there’s one more thing you need to be aware of: unless your region is in the United States, you’ll need to define the region explicitly when you are creating the bucket. Otherwise you will get an IllegalLocationConstraintException. You need to provide both a bucket name and a bucket configuration where you must specify the region, which in my case is eu-west-1. This isn’t ideal. Imagine that you want to take your code and deploy it to the cloud. Your task will become increasingly more difficult because you’ve now hardcoded the region. You could refactor the region and transform it into an environment variable, but then you’d have one more thing to manage. The nice part is that this code works no matter where you want to deploy it: locally/EC2/Lambda. Moreover, you don’t need to hardcode your region. As both the client and the resource create buckets in the same way, you can pass either one as the s3_connection parameter. You’ve got your buckets. Next, you’ll want to start adding some files to them. You can name your objects by using standard file naming conventions. You can use any valid name. In this article, you’ll look at a more specific case that helps you understand how S3 works under the hood. If you’re planning on hosting a large number of files in your S3 bucket, there’s something you should keep in mind. If all your file names have a deterministic prefix that gets repeated for every file, such as a timestamp format like “YYYY-MM-DDThh:mm:ss”, then you will soon find that you’re running into performance issues when you’re trying to interact with your bucket. This will happen because S3 takes the prefix of the file and maps it onto a partition. The more files you add, the more will be assigned to the same partition, and that partition will be very heavy and less responsive. What can you do to keep that from happening? The easiest solution is to randomize the file name. You can imagine many different implementations, but in this case, you’ll use the trusted uuid module to help with that. To make the file names easier to read for this tutorial, you’ll be taking the first six characters of the generated number’s hex representation and concatenate it with your base file name. By adding randomness to your file names, you can efficiently distribute your data within your S3 bucket. The next step after creating your file is to see how to integrate it into your S3 workflow. This is where the resource’s classes play an important role, as these abstractions make it easy to work with S3. The reason you have not seen any errors with creating the first_object variable is that Boto3 doesn’t make calls to AWS to create the reference. The bucket_name and the key are called identifiers, and they are the necessary parameters to create an Object. Any other attribute of an Object, such as its size, is lazily loaded. 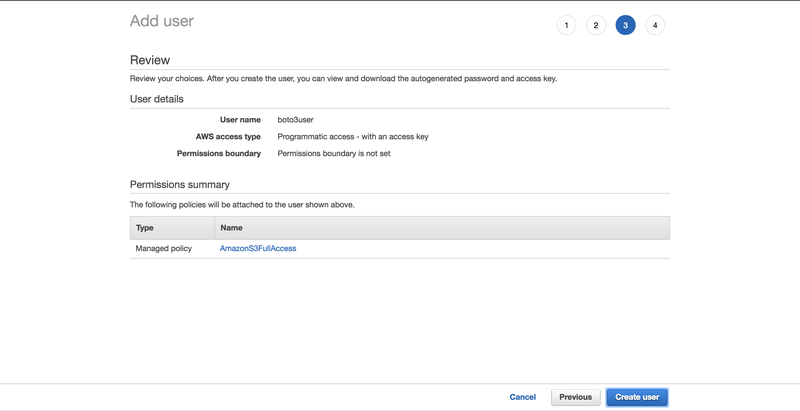 This means that for Boto3 to get the requested attributes, it has to make calls to AWS. Bucket and Object are sub-resources of one another. Sub-resources are methods that create a new instance of a child resource. The parent’s identifiers get passed to the child resource. Great, you now understand how to generate a Bucket and an Object. Next, you’ll get to upload your newly generated file to S3 using these constructs. In each case, you have to provide the Filename, which is the path of the file you want to upload. You’ll now explore the three alternatives. Feel free to pick whichever you like most to upload the first_file_name to S3. You have successfully uploaded your file to S3 using one of the three available methods. In the upcoming sections, you’ll mainly work with the Object class, as the operations are very similar between the client and the Bucket versions. You’ve successfully downloaded your file from S3. Next, you’ll see how to copy the same file between your S3 buckets using a single API call. Note: If you’re aiming to replicate your S3 objects to a bucket in a different region, have a look at Cross Region Replication. You’ve now seen how to use S3’s core operations. You’re ready to take your knowledge to the next level with more complex characteristics in the upcoming sections. In this section, you’re going to explore more elaborate S3 features. You’ll see examples of how to use them and the benefits they can bring to your applications. Access Control Lists (ACLs) help you manage access to your buckets and the objects within them. They are considered the legacy way of administrating permissions to S3. Why should you know about them? If you have to manage access to individual objects, then you would use an Object ACL. You have seen how you can use ACLs to manage access to individual objects. Next, you’ll see how you can add an extra layer of security to your objects by using encryption. Note: If you’re looking to split your data into multiple categories, have a look at tags. You can grant access to the objects based on their tags. With S3, you can protect your data using encryption. You’ll explore server-side encryption using the AES-256 algorithm where AWS manages both the encryption and the keys. You now understand how to add an extra layer of protection to your objects using the AES-256 server-side encryption algorithm offered by AWS. Every object that you add to your S3 bucket is associated with a storage class. All the available storage classes offer high durability. You choose how you want to store your objects based on your application’s performance access requirements. If you want to change the storage class of an existing object, you need to recreate the object. Note: If you make changes to your object, you might find that your local instance doesn’t show them. What you need to do at that point is call .reload() to fetch the newest version of your object. Note: Use LifeCycle Configurations to transition objects through the different classes as you find the need for them. They will automatically transition these objects for you. You should use versioning to keep a complete record of your objects over time. It also acts as a protection mechanism against accidental deletion of your objects. When you request a versioned object, Boto3 will retrieve the latest version. When you add a new version of an object, the storage that object takes in total is the sum of the size of its versions. So if you’re storing an object of 1 GB, and you create 10 versions, then you have to pay for 10GB of storage. In this section, you’ve seen how to work with some of the most important S3 attributes and add them to your objects. Next, you’ll see how to easily traverse your buckets and objects. If you need to retrieve information from or apply an operation to all your S3 resources, Boto3 gives you several ways to iteratively traverse your buckets and your objects. You’ll start by traversing all your created buckets. You have seen how to iterate through the buckets you have in your account. In the upcoming section, you’ll pick one of your buckets and iteratively view the objects it contains. You can now iteratively perform operations on your buckets and objects. You’re almost done. There’s one more thing you should know at this stage: how to delete all the resources you’ve created in this tutorial. To remove all the buckets and objects you have created, you must first make sure that your buckets have no objects within them. To be able to delete a bucket, you must first delete every single object within the bucket, or else the BucketNotEmpty exception will be raised. When you have a versioned bucket, you need to delete every object and all its versions. The above code works whether or not you have enabled versioning on your bucket. If you haven’t, the version of the objects will be null. You can batch up to 1000 deletions in one API call, using .delete_objects() on your Bucket instance, which is more cost-effective than individually deleting each object. You’ve successfully removed all the objects from both your buckets. You’re now ready to delete the buckets. Both the operations were successful because you emptied each bucket before attempting to delete it. You’ve now run some of the most important operations that you can perform with S3 and Boto3. Congratulations on making it this far! As a bonus, let’s explore some of the advantages of managing S3 resources with Infrastructure as Code. Python Code or Infrastructure as Code (IaC)? As you’ve seen, most of the interactions you’ve had with S3 in this tutorial had to do with objects. You didn’t see many bucket-related operations, such as adding policies to the bucket, adding a LifeCycle rule to transition your objects through the storage classes, archive them to Glacier or delete them altogether or enforcing that all objects be encrypted by configuring Bucket Encryption. Manually managing the state of your buckets via Boto3’s clients or resources becomes increasingly difficult as your application starts adding other services and grows more complex. To monitor your infrastructure in concert with Boto3, consider using an Infrastructure as Code (IaC) tool such as CloudFormation or Terraform to manage your application’s infrastructure. Either one of these tools will maintain the state of your infrastructure and inform you of the changes that you’ve applied. Any bucket related-operation that modifies the bucket in any way should be done via IaC. If you want all your objects to act in the same way (all encrypted, or all public, for example), usually there is a way to do this directly using IaC, by adding a Bucket Policy or a specific Bucket property. Bucket read operations, such as iterating through the contents of a bucket, should be done using Boto3. Object-related operations at an individual object level should be done using Boto3. Congratulations on making it to the end of this tutorial! You’re now equipped to start working programmatically with S3. You now know how to create objects, upload them to S3, download their contents and change their attributes directly from your script, all while avoiding common pitfalls with Boto3. May this tutorial be a stepping stone in your journey to building something great using AWS! Original article title: Python, Boto3, and AWS S3: Demystified. This full article can be read at: Python, Boto3, and AWS S3: Demystified.